David Fisher is an inspector for the Environmental Perfection Agency (EPA), a bureaucracy in charge of regulating the industrial by-products (pollution) caused by using magical spells in an alternate America where most of the technology is based on magic or the actions of any deities or demons that people believe in. For example, the telephones work because there are imps that relay messages back and forth, salamanders produce heat, and vehicles are actually flying carpets. 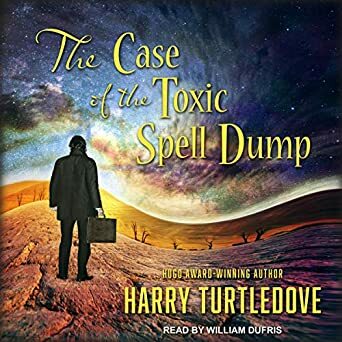 One night, David gets a frantic call from a superior who tells him that there’s some unusual activity at a spell dump north of this world’s version of Los Angeles. A spell dump is where companies and other entities guard the spells they devise so they can keep them secret, and so any dangerous by-products of the magic are contained. When David visits the spell dump, he notices some oddities that concern him. After he checks the records at a nearby Catholic monastery and discovers that several children from the surrounding area have been born without souls, he suspects a toxic leak from the dump. As he continues to follow the clues, he becomes even more worried and, when his fiancée (Judith) is kidnapped, he starts to panic. The Case of the Toxic Spell Dump (1993) has an interesting premise, it moves at a nice pace, and I liked David and Judith and their mature relationship. But I got tired of the silly puns which reminded me of a less puerile version of some of Piers Anthony’s works. I also don’t think Harry Turtledove’s world worked very well — technology based on magic and the integration of all the world’s faiths (all of which are true) just didn’t meld into a believable world. On the way, I passed a church dedicated to St. Andrew. Actually, to San Andreas because it was an Aztecan neighborhood. A line of penitents was filing in. I wondered why. Saint Andrew’s feast day isn’t until November. Then I remembered the morning’s earthquake. No doubt they were calling on the saint to keep more, and worse, from happening. Their chants rang so loud and sincere, they made me sure that if another earthquake did strike, it wouldn’t be San Andreas’s fault. Up til then I hadn’t noticed the boss of the team was a woman. She was black, slim, maybe my age, not half bad, though she looked both too smart and too tough to be model pretty. And we’re also told that Europeans did more with the lands in America than the original inhabitants would have done in the same amount of time. Yikes! So, yeah, there were a few things that made me cringe, but mostly it was the puns. This kind of story is not my thing, but it’s an interesting premise, and it’s well written with some good characters, so if puns are your thing, give this a try. The audio version was recently released by Tantor Audio. It’s 13.5 hours long (though I sped it up) and the performance by narrator William Dufris (one of my favorites) is superb. Published in 1993. Audio version published in December 2018. In an alternate America that runs on magic, a potential environmental disaster plunges an overworked bureaucrat into a deadly conspiracy of evil gods and darkest sorcery. David Fisher pushes paper for the EPA in a world that’s a lot like ours…only different. In this California – and throughout the alternate United States – all gods are real, science doesn’t exist, and magic rules everything, running imp-driven computers and creating anxiety-inducing bumper-to-bumper flying-carpet rush hours. Unfortunately, unchecked magic use can leave dangerous residues, creating hours of mind-numbing deskwork for David and his fellow bureaucrats at the Environmental Perfection Agency. Now a leakage at a toxic spell dump in Angels City is about to complicate David’s life in ways he never imagined, unleashing vampires, werewolves, and soulless babies. Even the actual spooks at the CIA are concerned. But looking too closely into what might be more than just an accident could have David stepping on the toes of some very nasty deities indeed, imperiling his future on the Other Side…and on this one, as well. When it comes to creating alternate histories – and worlds – no one does it better than the great Harry Turtledove. The multiple-award-winning master of the fantastic carries listeners on a droll thrill ride through a richly detailed, ingeniously imagined fantasy reality where the impossible is mundane – and absolutely anything can happen. Oh, yes, I remember those puns. I do think they were the point, (and boy, were many of them LABORED!). I remember thinking when I originally read it that the world-building was thin, just mostly “replace airplanes with flying carpets,” etc. Alternate history was his strong suit. Still when it came out in the era of Superfund sites, this title was funny. Puns can be fun when, as you say, they’re spontaneous. But when I see them coming from a mile away (San Andreas’ fault, etc.) they just land with a thud. Yes, a pun-flaw this series shares with some of the Simon R Green books, I think.